Following simultaneous raids in six States, at least five activists are believed to have been detained for alleged Maoist links. 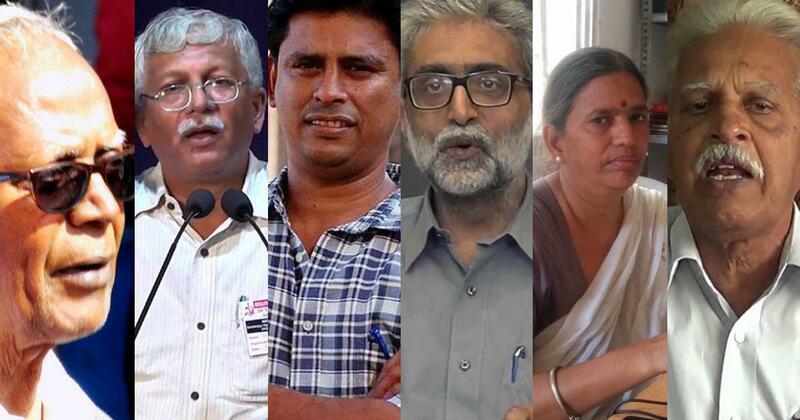 At least five human rights activists were taken into police custody on Tuesday following simultaneous raids on the residences of several well-known activists in six States for their alleged Maoist links. As per reports and sources; Sudha Bhardwaj, Arun Ferreira, Vernon Gonsalvez, Gautam Navlakha and Varavara Rao have been taken into police custody. There have also been reports that Anand Teltumbde and Father Stan Swamy might have been held. The raids appear to be the result of their involvement in the Elgaar Parishad conference in Pune on December 31, 2017 through which they have been linked to the Bhima Koregaon violence in January. Most of the arrested are likely to be taken to Pune. In Gautam Navlakha's case, the Delhi High Court, in response to a habeas corpus petition, stayed his transit remand to Pune and ordered that he be kept under house detention until further orders. The High Court will hear the matter tomorrow. A similar order was passed by Punjab and Haryana High Court in case of Sudha Bharadwaj. Also See: Urban Naxalism: A Garb to Suppress Dissent and Resistance? As per reports and sources, the activists whose residences were raided are: Father Stan Swamy, Arun Ferreira, Susan Abraham, Vernon Gonsalvez, Gautam Navlakha, Anand Teltumbde and Sudha Bhardwaj. Also raided were the homes of activist Varavara Rao, his daughter Anala and her husband KV Kurmanath in Hyderabad. Various leftist parties, peoples' organizations and activists condemned the raids and the arrests. The CPI(M), in a statement, called the raids a "brazen attack on democratic rights and civil liberties" and demanded the withdrawal of cases against the activists and their immediate release. The CPI(ML) Liberation called the move reminiscent of the Emergency and termed it "an attempt to brand all dissenting voices as 'anti national' and intimidate them as the Parliamentary polls draw nearer." A statement issued by activists and public intellectuals termed it "a conspiracy to divert attention from the gravity of the Sanatan Sanstha conspiracy to carry out serial bomb attacks on Eid and Ganesh Chaturthi." In an interview with Newsclick in July, Sudha Bharadwaj had rubbished allegations of links to Maoists and said she would continue her work irrespective of what the media said. Most of these activists have relentlessly striven for the expansion of civil liberties in India. Father Stan Swamy is an active campaigner against communalism in Jharkhand. Arun Ferreira is an activist who was held as an under-trial for his alleged links with the Maoists. It was only in January 2014 that he was finally acquitted in all the cases against him. He has co-authored several articles with Vernon Gonsalvez on a range of social issues such as casteism, communalism and the glaring economic inequality in India. Varavara Rao is a Marxist writer and taught Telugu literature at the undergraduate and postgraduate level. Sudha Bhardwaj is an advocate and the national secretary for People's Union for Civil Liberties (PUCL). According to the panchnama drawn after the raid on her residence, Sudha Bhardwaj said, “if you have come with a search warrant, please come inside and search”. The panchnama was signed by an inspector from the Vishrambaug Police Station. The Indian Penal Code provisions invoked in the raid and investigation are; promoting enmity and doing acts prejudicial to the maintenance of harmony between people of different groups, statements amounting to public mischief, abetting the commission of an offence by ten or more persons as well as criminal conspiracy. Under the Unlawful Activities Prevention Act, the provision invoked are: punishment for a terrorist act, raising funds for a terrorist act, conspiracy to commit a terrorist act, membership of a terrorist organisation and supporting a terrorist organisation. Also See: "BJP Wants to Push Back the Dalit Movement"
These simultaneous raids have come following the raids conducted in connection with the same issue in June when five persons were arrested under similar provisions: Sudhir Dhawale, Rona Wilson, Surendra Gadling, Shoma Sen and Mahesh Raut.